ERIC: There was the day we were born. There was the minute Morgan and I decided we were best friends for life. The years where we stuck by each other’s side—as Morgan’s mom died, as he moved across town, as I joined the football team, as my parents started fighting. But sometimes I worry that Morgan and I won’t be best friends forever. That there’ll be a day, a minute, a second, where it all falls apart and there’s no turning back the clock. MORGAN: I know that every birthday should feel like a new beginning, but I’m trapped in this mixed-up body, in this wrong life, in Nowheresville, Tennessee, on repeat. With a dad who cares about his football team more than me, a mom I miss more than anything, and a best friend who can never know my biggest secret. Maybe one day I’ll be ready to become the person I am inside. To become her. To tell the world. To tell Eric. But when? Six years of birthdays reveal Eric and Morgan’s destiny as they come together, drift apart, fall in love, and discover who they’re meant to be—and if they’re meant to be together. 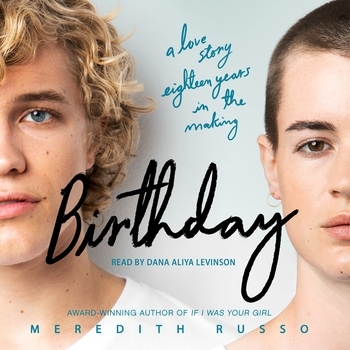 From the award-winning author of If I Was Your Girl, Meredith Russo, comes a heart-wrenching and universal story of identity, first love, and fate.